This weekend, in the Houston area and across our country, we saw and felt the energy and intention of a new generation in America. 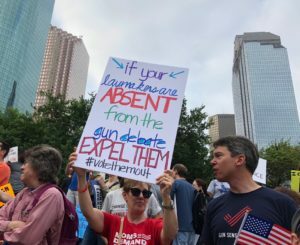 A generation that refuses to accept the broken and divisive politics of narrow special interest groups like the NRA. When 94% of Americans support a Universal Background Check for all gun purchases, yet our Congress refuses to act and keeps putting our communities at risk of gun violence, our students and young people are saying, "Enough!" and "Never again!" Most importantly, they are backing up their words with actions like the rallies, marches, and voter registration drives occurring across our country. This past week, I also had the honor of meeting Congresswoman Gabby Giffords in Houston. Her courageous leadership and fierce determination to bring common sense gun safety measures to the fore and to stop gun violence in America are inspiring and motivating. Congresswoman Giffords and her husband, Navy combat veteran and retired NASA astronaut Captain Mark Kelly, lead Giffords, an organization working across the country to fight gun violence and make common sense gun safety measures the law in our states and in our country. NOW is the time to bring common sense gun safety measures to our state and our country. NOW is the time to stand up, to march, and most importantly, to use your voice and VOTE for the type of positive changes the majority of our country seeks. When I wrote in the past for common sense gun safety measures like universal background checks, banning the sale of guns to persons on terrorist and no-fly lists, and stopping the sale of assault weapons and high-capacity magazines, I apparently earned my first F, a grade from the NRA. As your congressman, I will be accessible and accountable to you. Nobody else. Isn't that the way it should be?